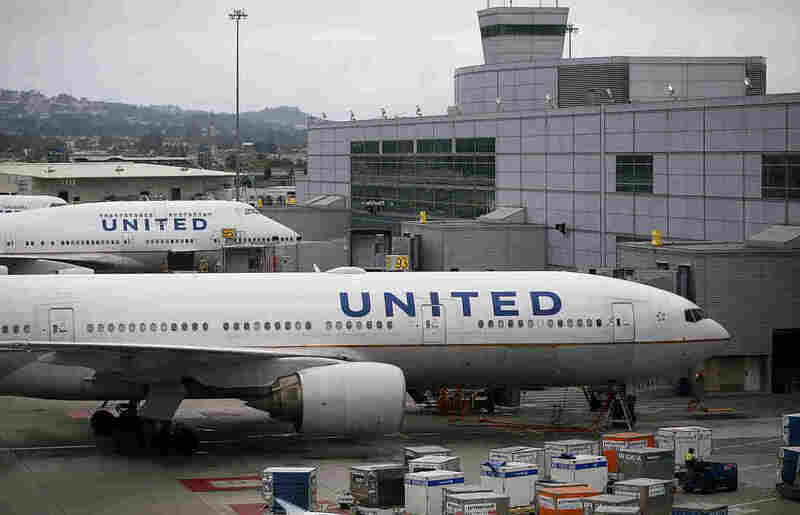 United Airlines Faces Steep Ascent In Not-So-Friendly Skies Beset by a record of flight delays, dismal passenger satisfaction and widespread tech glitches, the nation's second-largest airline is seeking ways to restore customer confidence and employee morale. United Airlines planes sit on the tarmac at San Francisco International Airport on July 8, grounded by a computer glitch. Some 3,500 United passengers around the world were delayed. "I'm not a fond customer of United at all," says Sengupta, 53, of West Newton, Mass. "I've never had a good flying experience. They pack people like sardines ... and if I would have to put a number to it, I would say 7 out of 10 times when I flew United, I've had a problem in terms of getting in late, way too late, so I'm fairly sure I'll miss my connecting flight." Another frequent flier, 49-year-old Kathy Karlesses of Philadelphia, says she finds flying United "not that great." "Their on-time performance is pretty dismal and service in the air is nothing special," she says. Karlesses says she, too, is shocked when her United flights are actually on time. Government figures show the nation's second-largest airline consistently lags behind its competitors in on-time performance. In July, according to the Department of Transportation, just 73.5 percent of United flights arrived at their destination on time. Only Frontier and Spirit Airlines were worse. 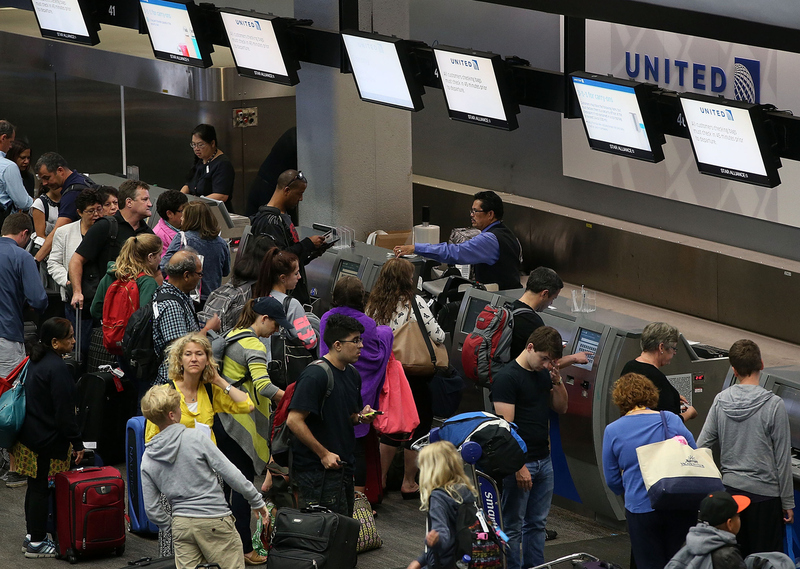 United also consistently ranks poor in customer service surveys. In the annual American Consumer Satisfaction Index, United ranks seventh out of the nine biggest airlines. The 2015 J.D. Power Airline Satisfaction Study ranks United dead last among major North American carriers in customer satisfaction. Karlesses does travel on other airlines, and she says she is often surprised by how different it is. She says she is "seriously considering" taking her business elsewhere. "I'd think [United] would make it easier to stay loyal but they're making it painfully hard to stay," she says. "Every way you can measure an airline's performance, they fail," says Vicki Bryan, an airline industry analyst for Gimme Credit, an independent corporate bond research firm. Bryan says United's troubles extend beyond flight operations to its website, its reservation and check-in systems, and employee relations — and that, she says, is costing the airline. "They have ceded market share in the most lucrative kind of passenger segments, the business class customer," Bryan says. One of those customers is Edward Pizzarello, who writes the frequent-flier blog Pizza in Motion. United passengers wait to check in at San Francisco International Airport on July 8. A similar computer problem disrupted flights in June as well. Pizzarello says he travels nearly 200,000 miles a year for his job at a private investment firm, spending between $20,000 and $30,000 annually on airfare. After years of being loyal to United Airlines, he says he now flies more often than not on American and other competitors. "United lost my trust a couple of years ago and continues to reinforce the reasons I book away from them," Pizzarello says. "I really don't think it can get worse. They've got operational reliability issues, they've got customer service issues, and their employees aren't very happy about what they do." Fixing problems from IT glitches and website outages to lost luggage and chronically late flights presents a big challenge for new United CEO Oscar Munoz, who took over the company Sept. 8 after former CEO Jeff Smisek stepped down amid scandal. And Munoz acknowledged those troubles in a recent letter to frequent fliers saying, "We can do better." "If our performance has not met your expectations, I want you to know I'm committed to learning how to better meet your needs and desires," he added in the email, which critics noted didn't have a link or address to which customers could reply. In a conference call the day he took over the beleaguered airline, Munoz told analysts the company needs to "reach our customers with a better service product and we need to convince them that that is our commitment. "At the front of everything we do is we have to realize that we have millions of human beings traveling on our equipment and they're trying to get someplace, either a business or family event," Munoz added. "And we've just got to think of a service excellence model." Already, United is simplifying some of its domestic routes with more planes flying out and back from one city to another to help minimize delays that tend to ripple across the country when bad weather hits. A United spokeswoman says the airline has also made recent investments in improving food, frequent-flier clubs, facilities and operations. But in addition to winning back customers, United must also find a way to boost its workers' morale. "Employees are incredibly upset," says Sara Nelson, president of the Association of Flight Attendants. "The crews have to put up with the same sort of pains that the passengers are, and the crews are really the passengers' best advocates. They see on a daily basis what passengers are going through, and I hear from flight attendants all the time saying, 'All I have to do every single day is say, 'I'm sorry.' "
That frustration among workers is compounded by the fact that five years after United and Continental merged, the airlines' 24,000 flight attendants, as well as United's 9,000 mechanics, are still without a new unified contract. Nonetheless, Nelson and others are optimistic that the long overdue leadership change at the top will lead to dramatic improvements. If not, a once-great airline may continue to flounder and many valuable customers may never return. "It would take a sea change from their competitors for me to shift a sizable chunk of business back to them," Pizzarello writes on his blog. "United has ingrained in me that I am a transaction, as valuable as the fare I buy on any given day, and nothing more (and on some days, much less). You can only whip the horse for so long before it doesn't respond."